Denver's Smell-O-Scope Targets Marijuana's Skunky Scent : The Two-Way Recreational marijuana is legal in Colorado. But that doesn't mean residents want their air to smell like a pot rally. Denver is getting more calls to enforce an odor ordinance that can impose a buzz-killing fine on violators. To find them, the city relies on a device called the Nasal Ranger. 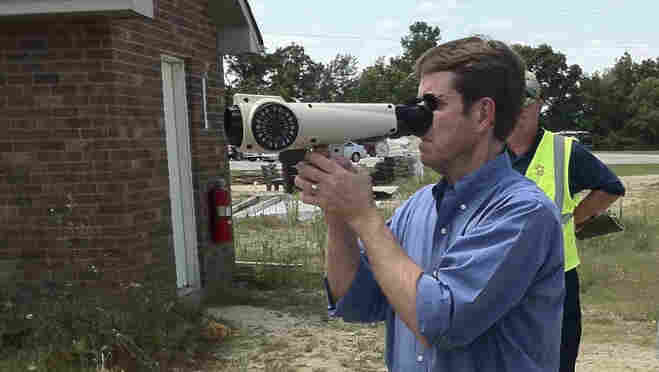 A man uses the Nasal Ranger to detect smells in the southern U.S., in this photo provided by St. Croix Sensory. In Denver, the device is being used to monitor complaints of strong marijuana smells. Recreational marijuana is legal in Colorado. But that doesn't mean residents want the air to smell like a pot rally. Denver is getting more calls to enforce an odor ordinance that can impose a buzz-killing fine on violators. To find them, the city relies on a device called the Nasal Ranger. And that's where licensed smell investigator Ben Siller comes in. A member of Denver's Department of Environmental Health, he's trained to use an olfactometer to determine if people are breaking laws that protect the purity of Denver's air. "Ben Siller looked ridiculous on a recent afternoon, standing on a downtown Denver street corner with a giant device clamped to his face sniffing the air for odorous evidence of marijuana." The Nasal Ranger is a cone-shaped device resembling a megaphone that's made by St. Croix Sensory, a company based in Minnesota. It samples the air to help an operator detect the presence and strength of odors. As others have noted, the device looks like a scaled-down and streamlined version of the Smell-O-Scope created by Professor Farnsworth on the TV series Futurama. In Denver, the scent of marijuana would have to be very strong — exceeding a level of detection when one volume of the scented air is combined with seven volumes of clean air — to trigger a formal response and possible fine. Siller tells the Post that it's been nearly 20 years since anyone broke that threshold. A violation could bring a fine of up to $2,000, Denver's ABC 7 News reported this summer. Many expect Siller and his colleagues to get more calls as Colorado's pot industry continues to mature. The state's first stores selling marijuana for recreational use are scheduled to open in January. As that date approaches, the city is tweaking its rules to curtail "open and public" marijuana use, as The Denver Post reported Tuesday. That's when the City Council backed away from a rules proposal that could have exposed people to fines for smoking marijuana in their front yard, or for having the scent escape a window. "If someone is doing it out on the front porch and my kids are around, it would definitely bother me and after a while I would maybe call it in," Denver resident Karyn Wingard-Manuel tells the city's KDVR TV. The station also talked to Siller, who said his department often works with people to minimize smells that annoy their neighbors. "If need be, we'll go out and contact the party, let them know that a complaint has been filed even though there is not a violation and we'll let them know that perhaps there's some way they can work it out," he said.